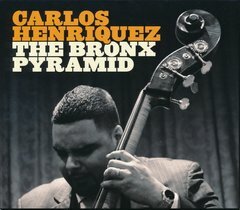 Carlos Henriquez’s THE BRONX PYRAMID marks the Bronx-born, Nuyorican bassist’s first album as a leader—and the emergence of a fully fledged Latin jazz master. Joined by guest stars Rubén Blades and Pedrito Martinez and band members including drummer and fellow Jazz at Lincoln Center Orchestra member Ali Jackson, Henriquez expertly blends modern jazz with Latin rhythms, demonstrating why he’s been performing with greats like Tito Puente, Eddie Palmieri, and Celia Cruz since he was 14. When Henriquez’s high school band won the inaugural Essentially Ellington competition in 1996, he came to the attention of Wynton Marsalis, who took the bassist on the road shortly after he graduated high school. Since then, Henriquez has toured the world with the Wynton Marsalis Septet, Chris Botti, and the Jazz at Lincoln Center Orchestra, with whom he’ll be touring the United States throughout the summer and fall. On THE BRONX PYRAMID, Henriquez expertly combines the best of the Latin and jazz traditions into an infectious album that will make you move no matter your favorite genre.